Bus from Kuala Lumpur to Kuala Berang is the most convenient direct express bus service for both locals and tourists. Besides local travelling back to hometown in Kuala Berang, some locals and tourists would travel to Kuala Berang to visit the largest man-made lake in South East Asia, Kenyir Lake. Kuala Berang is the gateway to Kenyir Lake. Why Taking Bus from Kuala Lumpur to Kuala Berang? First, there is no train service available between Kuala Lumpur and Kuala Berang. Second, beside the flight ticket is expensive than bus ticket, there is no direct flight available for this route service. Flight from Kuala Lumpur would land on the nearest airport in Kuala Terengganu. Passengers would have to transfer bus from Kuala Terengganu to Kuala Berang. Therefore, direct bus from Kuala Lumpur to Kuala Berang is the most budget and hassle-free transportation option to travel from Kuala Lumpur to Kuala Berang. Mega Jaya Express is the only bus operator serving bus from Kuala Lumpur to Kuala Berang. There is only 2 daily departure at 9:45pm and 10:15pm. Please note that bus from Kuala Lumpur to Kuala Berang is overnight bus service. Passengers are advised to bring along your jacket because night bus normally cold. The travel duration from Kuala Lumpur to Kuala Berang is approximately 6 hours, depending on the traffic and weather conditions. The bus fare is charged at flat price RM 43.00. Washroom break will be given during the journey. The departure point in Kuala Lumpur is Terminal Bersepadu Selatan (TBS). Passenger could easily access to TBS by city bus, monorail, KTM or taxi. The arrival point in Kuala Berang is Terminal Bus Kuala Berang. From there you can take a short taxi ride to Kenyir Lake. Want to have an eco-adventure trip to Kenyir Lake? 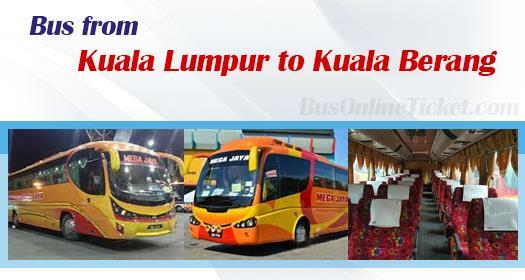 Book your bus ticket from Kuala Lumpur to Kuala Berang with BusOnlineTicket.com now. You will receive instant confirmation upon payment has been made successfully.